Living without your natural teeth is a complex problem that modern dentistry has been able to comfortably and effectively solve. 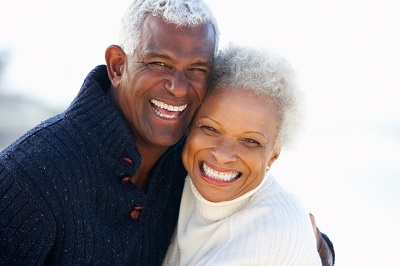 At the Rutherford, NJ dental office of Dr. Lee T. Frost we’re able to help patients achieve long-lasting and natural-looking restorations for total tooth loss with All-on-4 implant dentures. All-on-4 is a trusted method of implant-supported replacements for tooth loss provided by Nobel BioCare, a leader in implant dentistry. With the help of four dental implant posts, which are surgically added to jaw bone for maximum stability, you can enjoy a new smile with strong, beautiful teeth. Unlike screw-retained dentures that require an entire arch of implant posts, the All-on-4 process utilizes four strategically placed implants to permanently secure replacement teeth. You can get a whole new smile in a way that is cost-effective and has a positive impact on oral function and overall health and wellness – no more loose-fitting or uncomfortable dentures. If you wear dentures on either your upper or lower jaw arch, you understand how much of a hassle this can sometimes be. Removable dentures must be applied each day with adhesive and are known to become loose throughout the day as you speak and eat. Removable dentures can also irritate soft tissue and block your palate. Your All-on-4 dentures will rest on implant posts, not gums, so there is no damage or irritation caused to sensitive soft tissue. Your new teeth will feel as natural as your own teeth. Implant-supported dentures do not need to be re-applied each day with denture paste and do not slip, or click, throughout the day. You can enjoy your normal daily routine, without having to worry about your prosthetics causing embarrassing problems. The discomfort caused by traditional dentures often has a significant impact on patients’ overall health and feeling of wellness. 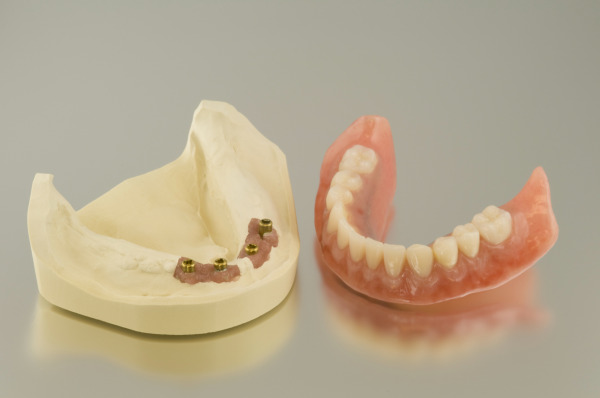 The inconvenience of not being able to eat as you normally would, or having to struggle with bulky prosthetics, often makes standard dentures more uncomfortable than beneficial. But with implant-supported dentures utilizing the All-on-4 method, we are able to provide patients with life-changing new teeth and minimal implant surgery. All-on-4 is a safe and effective way to treat total tooth loss. Dr. Lee T. Frost helps patients get permanent new smiles with this high-tech treatment solution for implant-based dentures. With the help of 3D imaging, we are able to surgically place your dental implants and provide an arch of new teeth, right from our office. You won’t have to spend time visiting multiple specialists to get the care you need for permanent denture treatment. With precise imaging, treatment planning and implant surgery can be carried out in a way that best benefits our patients, and helps avoid the need for bone grafting or other common pre-treatments. Your implant posts will be placed in one visit to our office and will be topped with beautiful, temporary restorations, so you can feel confident in your smile as soon as treatment is complete. Final implant-denture prosthetics can be placed after your implants have healed and integrated with surrounding tissue. If you have questions about how you can replace your removable dentures with permanent new teeth, or restore an arch of damaged teeth with implant-dentures, call our Rutherford All-on-4 dentist today for your consultation.